It wasn't all that long ago that I was talking about and encouraging you to get your spaniel going. Now with the season starting, and plenty of young game about, it may be that it is advisable to talk about keeping them under control and hunting a good pattern whilst they are going. One of the traps that many handlers fall into is allowing their dogs to pull steadily away from them until, at times, they are working out of gunshot range. The solution that many handlers seem to adopt is to walk as fast as possible in order to keep up with the dog. This leaves you with another problem. While walking at a speed necessary to keep within gunshot, you are probably missing a lot of ground and cover which could hold that elusive rabbit or bird. Your dog needs to be trained to work an effective pattern of ground that takes into account wind direction, scenting conditions and type of cover. This pattern should be such that nothing is left unchecked. Every tussock, bush, bramble scrub, whatever - has to be gone through and worked well. Some of the early trials, in past years, have been run in awful weather, with heavy rain, wet ground, tucked in rabbits and poor scenting conditions - demanding dogs that cover, in fact run over, nearly every inch of ground. 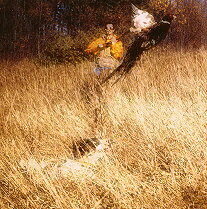 Even when hunting a foot one side of a rabbit usually meant that it was missed, as scent was just not carrying. These extreme conditions are rare, but they do occur. There are some grounds where scent is notorious for being poor. What causes it? We can only guess at. Not only do these grounds produce little scent, but even odd corners of usually good scenting ground can be poor, so the essential training in your hunting is to get your pattern right. When hunting a young dog, I like to have ground where I can see it at all times. Reeds and rush grass are ideal, but light woodland bottom and stubble turnip can also be perfect. In other words: somewhere that you can keep in touch. "...they also begin the think that all the pleasures in life come from being close to me." Generally, when you first cast a dog off to hunt after it has been waiting, the pent up energy releases itself into a rush. If you are not ready, your dog has gone too far ahead of you before you can touch the whistle. So be prepared the moment you cast your dog off, have the whistle in your mouth and your concentration on 'turbo'. Where possible, I always prefer to hunt a dog into the wind. It is difficult to teach a dog to take the wind direction into account when quartering - some dogs do it naturally, others never seem to get the idea. But if you work into the wind, the dog tends to keep closer and develops a more even pattern. When you do cast it off, cast it to the side and don't move forward. Give it the turn whistle and bring it back across the front of your body, making sure that in those first steps you don't walk over ground that hasn't been worked. Get your dog going in the flowing 'windscreen wiper' pattern from the very beginning. Even if your dog ignores the first turn whistle, get out and remind it to turn with a tug of the ear or a pull of the fur under the chin pulling it towards you with a pip-pip of the whistle. Some dogs turn on the whistle, look at you, see that you are walking forward, and come across in front much too far ahead. If this happens, try standing still as you blow the turn whistle and watch whether your dog turns more towards you, coming into your body as it quarters. If it doesn't, give a recall whistle as it turns, bringing it in close before casting it off using a flowing hand movement in the opposite direction. Do this regularly, so the dog goes out, turns, and works back towards your body before hunting out in the opposite direction. After awhile, the dog will realise that it is expected to cross close to you, and a much 'flatter' pattern will result.